Yes, Pesadik desserts of my youth left something to be desired. Dry angel food cake? Glow-in-the-dark fruit slices? No.thank.you. Fortunately I’ve matured. And so have Passover desserts! Can you go wrong with a chocolate molten cake? This one definitely doesn’t taste like it’s Kosher for Passover. Levana has totally outdone herself! I’ve been making chocolate covered strawberries for Pesach seder dessert for as long as I can remember. It’s so simple, and so delicious. I make a few pounds of these and we nosh on them throughout the chag. Last year, I tried making meringues for the first time. They are pretty simple, but also a bit finicky. They cracked easily and I found that they didn’t last very long – even in air-tight Tupperware. Fortunately, this wasn’t really an issue, since my children (selflessly) ate them all the first day. And then begged me to make more. I used Martha Stewart’s chocolate chip meringue recipe but there are thousands of recipes out there. In fact, I found these mint and chocolate meringues on Pinterest that I’m planning to Pesach-ify for this year. There’s no dessert combination I love more than mint and chocolate! I’ve told you about my love for lemon desserts, right? Well, this frozen lemon meringue pie is one of my absolute favorites – it’s a version of one by the illustrious Norene Gilletz – and I found it years ago on the Jewish Food List. I’m also gaga over the Frozen Lemon Wafer Cake from Passover Made Easy. I made Couldn’t Be Parve’s Raspberry Chocolate Truffles last year and O.M.G. These are so rich. So indulgent. So blow-your-mind good. The only drawback is that I couldn’t roll mine perfectly. A lot of them ended up like lopsided ovals – as above. Trust me, your mouth won’t mind. And for the record, my kids didn’t like them at all. “Too rich,” they said. Their loss definitely equaled my gain. Okay – I had to add this in. One of the things I love about Pesach is that I can serve up a huge bowl of fruit salad and everyone “oooh’s” in appreciation. (And yeah, so fine – I do usually serve a flourless chocolate cookie or piece of matzah crack on the side). What are your favorite Passover desserts? Please share links or recipes in the comments section below. I’d love to give almond cookies a try this year, so if anyone has a stellar recipe, definitely share! Looking for more Passover cooking inspiration? 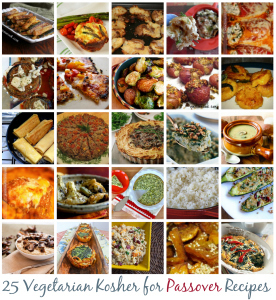 Check out all my Kosher for Passover Recipes, including this very popular list of 25 Vegetarian Passover Recipes. Oh boy – I think my kids would be very excited by your chocolate covered marshmallow idea. Hmmm….. This is a terrific roundup! Thanks. I saw this recipe for lemon truffles on Pinterest. I haven’t tried it, but it looks good. http://www.petite-kitchen.com/2013/03/raw-lemon-and-coconut-truffles.html I like zabaglione (really just a fancy name for custard sauce), and I like to keep some in the fridge to spoon over cut-up fresh fruit. If I’m feeling really fancy and have the time, I’ll put the fruit atop a meringue and then spoon the zabaglione on top. I haven’t tried this particular recipe for zabaglione, but my cookbooks aren’t out yet. http://www.lidiasitaly.com/recipes/detail/655 Happy cooking, everyone! Instead of butter, you can use coconut oil, which isn’t technically a replacement at 1:1 but is close enough. Gives the cake a nice coconut undertone. This looks fantastic – and you know I love subbing coconut oil. Thanks for sharing, Leah – those look great! I tried making these and I couldn’t get them out of the pan. I guess I didn’t grease it enough? Sorry to hear that Laura – I just sprayed a disposable foil pan (I used a smaller one than the recipe calls for – 8X8) with some oil and mine came out fine this year. There is no fat / grease in the recipe so maybe you need a little more grease in the pan to get them out. This one from Chef Laura Frankel is spectacular. You can freeze it, bake it, or bake half and put the rest on top THEN freeze it! Wonderful ingredients, it will become a family favorite! I’m curious to try that – the EVOO has me very curious. Does anyone have a suggestion on what to use in lieu of the raspberry puree? I’d love it, but no one else in my family would appreciate the chocolate/raspberry combination. 1/2 C of something sweet with moisture…thoughts? What about strawberry? Or cherry? I think we have three favorites here: 1. Lemon sorbet (or lemon strawberry sorbet – your recipe was a hit with us last year! ), 2. Meringues (easy family recipe), and 3. Chocolate chip cookies. I make really good ones using the same recipe I use all year long, but instead of flour, I do half cake meal and half nut flour – so they are gebrokts. But people always ask if they are Pesachdik! For the Matza Crack, what do you substitute for the butter? Coconut oil?